OK, we should understand by now that some of the best truly local hiking can be found at the many different units of the Chattahoochee National Wildlife Refuge. So when I was perusing their site, I stumbled upon a new unit of the CNWR, which had a link for hiking maps, but no maps. This was something I had to check out. So I made my way up to the Settles Bridge Unit in Suwanee, Georgia. Upon arriving, I noticed that the other folks there were certainly not there for hiking. Sure, there was a young couple out for a romantic stroll by the river, but most were in swimsuits and many were carrying canoes or tubes for water fun. The trailhead sign said that the hike was a mere .5 miles, and that with significant grades to them. So we ventured forward. The centerpiece of the park is the remnants of Settles Bridge, an Iron & Wood framework structure built in 1896, much of it rotted away or possibly stolen. The structure does span the entirety of the river and could be crossed with considerable difficulty, and there are signs posted letting you know that that is against the law. But if you search Youtube, you will find clips of folks jumping from the bridge into the water (for example here and here). I will tell you that isn’t something I would normally do. At the bridge, we first hiked up the river downstream and couldn’t make it that far, maybe about .2 miles. We came back under the bridge and headed downstream, initially at the top of the ridgeline. The trails are rough and lightly traveled, we headed that direction for about a ¼ mile and came to a turn away from the river which ran along a small creek. At one spot there was a “T” in the road, turning right would no doubt take you back to the parking area. We headed left, did a little wet foot crossing of the stream and follow on about a half mile. My belief is that this trail is part of the trail to connect the whole CNWR and not just part of Settles Bridge itself. We turned around and made our way back this time hugging the river. 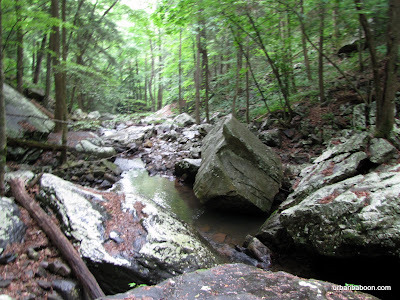 There was evidence of trails across the creek going upstream, but we did not explore that area. Along the river, you get views of the stream, and the rocks, and the bridge. We saw a pack of canoeists coming from the North and they landed at the bridge side dock. Apparently there is some sort of boat rental place that uses the bridge as an end marker. We came within about 8 feet of a huge bird pictured below. And then we made our way along the stream back. 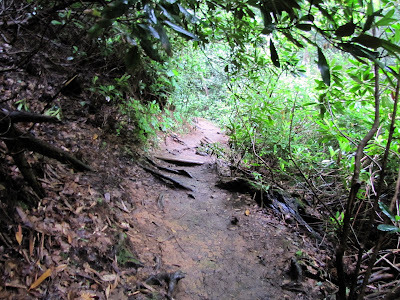 This “trail” runs maybe a ¼ mile and is some serious tricky footing, complete with rocks and mud and climbs, but fun nonetheless. I look forward to the completion of the Settles Bridge Trail System. Right now it is predominantly a happy swimming hole. But the serenity and peace there give me high hopes for the future of this greenspace. There is a nearby park of the same name, run by Gwinnett Parks & Recreation, which is very popular with dog lovers and skateboarders. Probably the most common thing people tell me about my site is that they can’t believe all of this stuff is in Georgia not too far from their home. The part of the site that consistently impresses them is the sheer quantity and beauty of the waterfalls that are here. 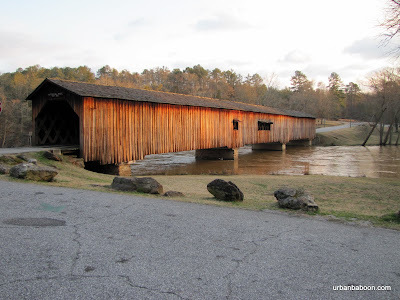 And many of them don’t require that much effort to see, I recently visited a prime example of that about an hour and 45 minutes to our North in Union County, not far from Blairsville, a place called Helton Creek Falls . What you get here is a very simple quarter of a mile walk in a bucolic setting, complete with the natural beauty of Georgia on all sides. And the payoff is simple and majestic: two beautiful waterfalls. 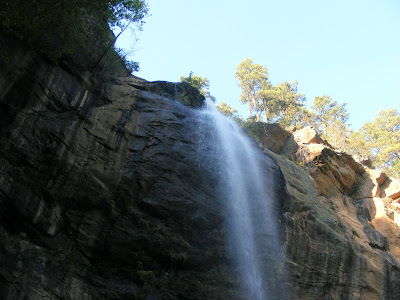 The first, known as Lower Helton Creek falls, is a visually stunning 30 foot drop in to a pristine clean pool. A bit further up (and I mean just a bit) is the more striking 60 foot drop known as Upper Helton Creek Falls. The two falls in tandem are reminiscent of DeSoto Falls, but these are much more active and interesting. There is a viewing deck for the upper falls. To get there you drive along US 19 from where ever you are coming. 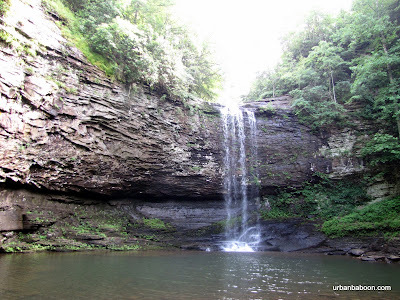 Just inside Union County about the midpoint between Vogel State Park and the famous Mountain Crossings at Walasi-Yi, (about a mile from each point) there will be a turn on a road appropriately named Helton Creek Falls Road. Drive on this road for 1.5 miles and it will become a gravel road. Continue about the same distance on the rough gravel road and you will find the parking area. The path is clearly marked and simple to navigate, but is not wheelchair or buggy friendly. To get away from it all, in the heat of the summer, nothing beats the North Georgia Mountains and their waterfalls. The Falls at Helton Creek are a great starting point for anyone who wants to invest just a half hour of their time to find out what I mean. You get simple beauty and tranquility with minimal effort. And hopefully it will inspire you to give more effort later. I was sent an email from a reader named Sheree that sent me searching through my strange collection of over 20,000 photos taken in and around Atlanta. In doing so, I felt compelled to write about a place that I visited by in the late Winter of 2007, as it may be an answer to her question. It fits most of the criteria for inclusion in this site, some historical buildings, something pretty to look at, and some hiking trails. I apologize to those who run the place for waiting so long to give it mention because it is exactly the sort of thing I love about living in Greater Atlanta. 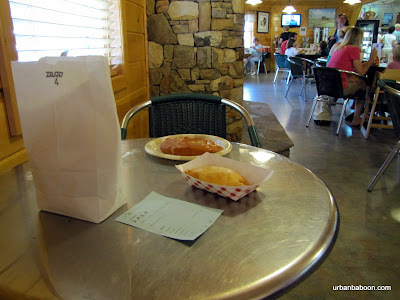 The place I am going to take you to now is the Autrey Mill Nature Preserve in Johns Creek, about 45 minutes North of Atlanta. 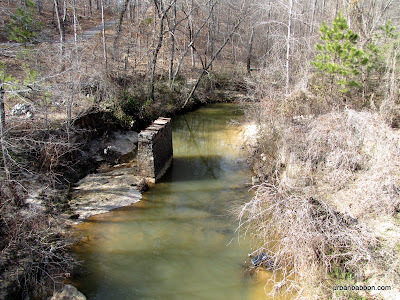 The feature that offers this its place its name is the Autrey Mill, built in the 1870’s on Sal’s Creek, it was used to grind corn and flour. There are ruins of the Mill as you walk up Sal’s Creek, unfortunately nothing significant, mostly overturned rocks of what was once a dam, I believe. At the front near the parking area are a number of historical buildings gathered together. The prettiest of the bunch is the fully restored 1890’s farmhouse known as the Summerour house. 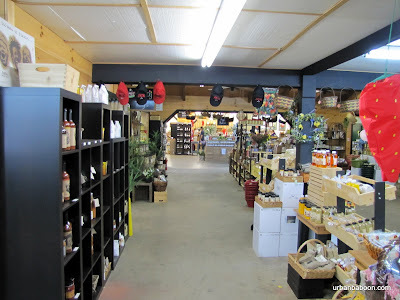 There is also a General Store, some tenants buildings, barns, and two churchs. The Old Warsaw Church is a simple Moravian building; the Debray Chapel, named for the last private owners of the land, would probably be more striking had it not been crushed by a tree during Hurricane Ivan. Since I made the trek, the have added a duck pond and some replica Indian dwellings. The trails are simple to follow and easy to walk spanning a little over 2 miles in entirety, if you walk along the creek looking for the meager ruins. Not long enough to get a thorough workout, but much better than sitting at home. No memorable ups and downs, unless you leave the preserve. And with its reasonable proximity, it makes for a nice evening stroll or family jaunt. One interesting note: on the trail you will find a half dozen or so stone monkey statues. On the day we went they were wearing scarves, but the scarves might not be there when you go. Now I love a good legend like the next guy, and a gentlemen at the park told me that they are there to commemorate the massacre of monkeys done by early settlers in the area. As the story goes, a circus train broke down or crashed nearby sending the monkeys scurrying into the woods near Sal’s Creek. The settlers, living in the 1800’s, never having seen monkeys, thought they were some kind of deranged mutant chipmunk or squirrel, thought them quite the nuisance and set out hunting them until all the poor monkeys were dead. It’s a nice story and I think a story of that kind was mentioned in the movie “The Greatest Show on Earth ” but there is no indication that something like that ever really happened . But a good story still is a good story. It seems that the good folks at the Autrey Mill Nature Preserve have been busy in the years following my visit. They have opened the aforementioned Indian exhibit and duck pond, as well as holding a number of events there currently including live theater and have opened a farm museum (some of these may require a fee). I applaud them for their work even in the face of the negative economy we all reside within. 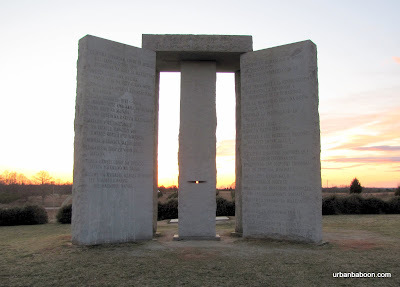 So if you are looking for a nearby getaway to the past in a natural setting, I encourage you to check it out. 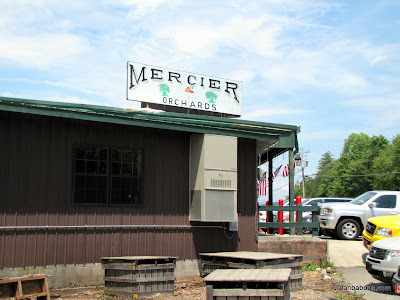 About 4 years ago, a new idea came to fruition in Gwinnett County. An idea to build a type of nature preserve on Ivy Creek. As a person always looking for a getaway that doesn’t require too much getting away, I rejoice in these endeavors. What Gwinnett County has built is something of a marvel, spitting distance from the Mall of Georgia in Buford. 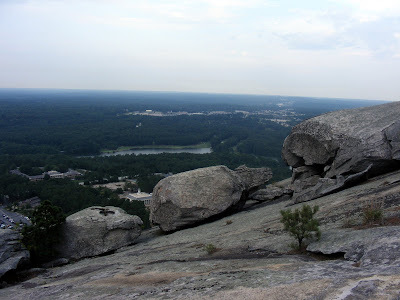 Sure its an hour away from Atlanta, but for us Gwinnettians, its right in our backyard. 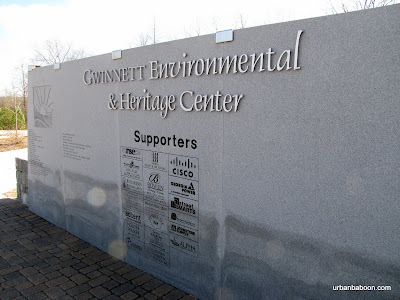 And it is known today as the Gwinnett Environmental and Heritage Center (abbreviated as GEHC). The main building itself is a bit of a wonder in its own right. 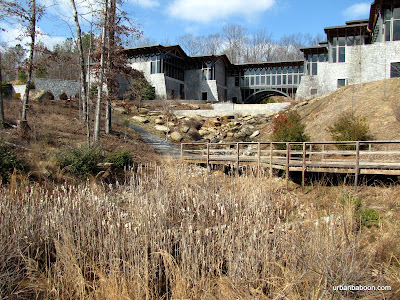 Unlike other similar nature centers like Autrey Mill, they leaned a little more to the future than to the past, creating a modern building and focusing on the science of nature. The main building a gold certified green building, meaning that it is at the forefront of energy conservation, and it carries several hands on exhibits about the nature and ecology of the area. I personally didn’t enter the building, being more interested in the trails, but the reviews are pretty stellar, especially from children. 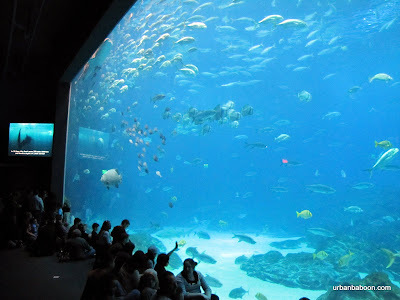 They are open 9am to 4pm, Monday thru Saturday, with the exception of 8 major holidays and the cost is $7.50 (adult), $5.50 (Seniors and ages 13-22 with Student ID), or $3.50 (ages 3-12), with a $3 additional charge for non-Gwinnett residents (Admission Pricing Here) . At this point the exhibits focus mostly on Water conservation, but there are rotating exhibits. The building is also a popular event facility for weddings and the like. Like I said, I went for the trails. 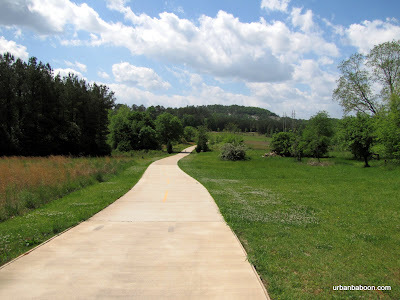 There are 4.8 miles of unpaved trail with and additional 2.9 miles of paved trail listed as 11 separate trails. The dirt trails are mostly short bursts that vary from .1 to 1 full mile, so my suggestion is to do several of them to get your exercise. I kind of wandered through several of them alone with no map or actual destination. What I found was an enjoyable wilderness setting, minutes from the hustle and bustle of the Mall of Georgia. There are some ups and downs but nothing too difficult (their ratings are on the map here). The best trails in my opinion were the sweet gum (because of the distance) , the two more strenuous trails (Forest Ecology and Holly), and the Ivy Creek Greenway (mostly for the Ivey Creek views). 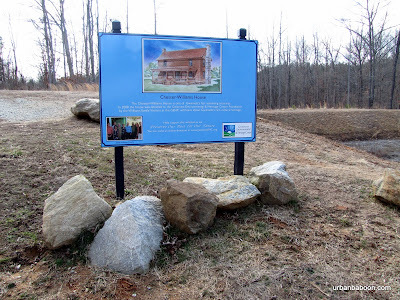 The Homesite loop trail has potential as they are in the process of collecting some old buildings, most notably the Chesser Williams House , but there is nothing there as of March 2010. 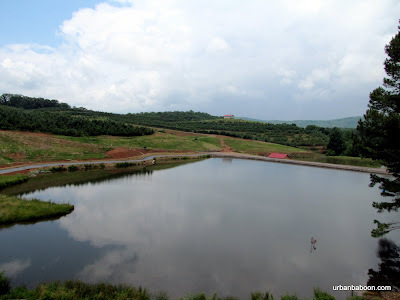 Taken as a whole, the Gwinnett Environmental and Heritage Center is a serene oasis in a busy part of Gwinnett County. Children and families should love it. And its destined to get better as they add improvements and exhibits. I couldn’t help wishing I had brought my bicycle as I thought it would be a fantastic bike path. I saw no bikes the day I went, but the website says they encourage bike enthusiasts to use it. About as far away as you can get without leaving Georgia sits a tremendously scenic state park, which I’ve been told rivals anything you have seen in the state. Because of its relatively remote location, it remains quite pristine and reasonably quiet. But the talk of the area is almost deafening. 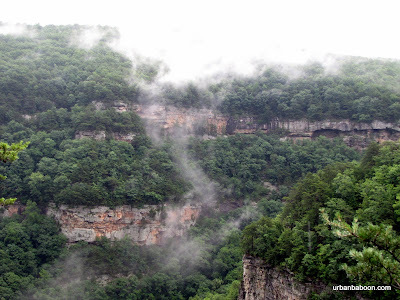 Located on the Western edge of Lookout Mountain about 2.5 hours Northwest of Atlanta stands what has been called the "Crown Jewel" of the Georgia State Park system: Cloudland Canyon State Park. The area was designated as a State Park in 1938 after large donations of land from private owners. The years have seen the park grow in size from 1924 acres to its present 3485. Prior to state ownership, it was known as Sitton‘s Gulch , and the prominent feature of the park is the Gulch or Canyon that serves as the centerpiece of the park. 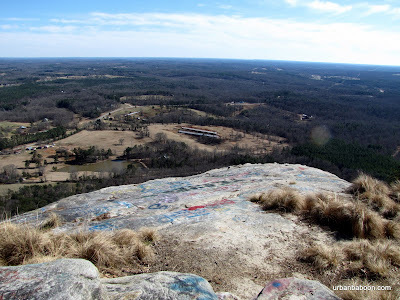 There are several areas along the ridgeline that provide majestic views of various nearby mountains and you can see well into Alabama. The gorge was carved out by Sitton’s Gulch Creek over centuries at the confluence of Daniels Creek and Bear Creek. This makes for some very pretty rock formations, both along the canyon’s walls and deposits along the canyon floor. 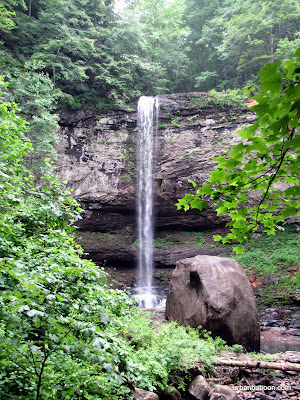 In addition to the scenic vistas, there are two serene waterfalls at the base of the gorge on Daniels Creek. They are very cleverly named Waterfall One and Waterfall Two, falling 85 and 60 feet respectively. To be honest the waterfalls are really a series of cascades and there are numerous other opportunities to see and hear the pleasant song of tumbling water along the way. 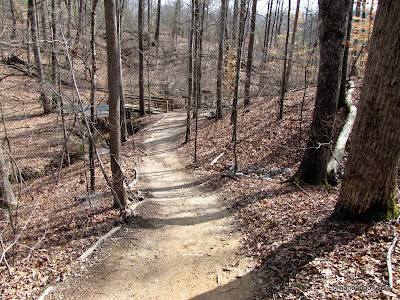 There are five separate hiking trails at the park. On the day we went, we hiked the 5 mile West Rim Loop trail and the 2 mile Waterfall trail. The water fall trail climbs about 1200 feet in and out of the canyon through a series of switchbacks enhanced with well over 600 stairs. The easier of the two falls (and prettier) takes you .1 miles down to Waterfall One. 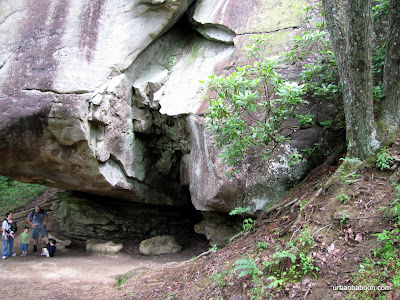 To get to Waterfall Two, you must climb part of the way out and then down .3 miles to its location. Although the water itself may be a little less impressive, the second waterfall area is much more majestic and littered with fallen rocks. 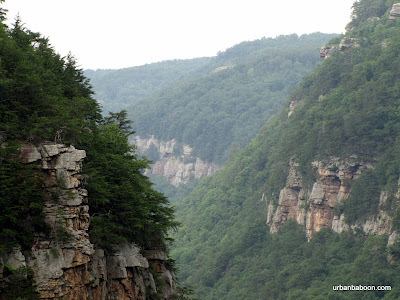 The West Rim Trail takes you along the ridgeline for the full view of the gulch and the areas beyond. 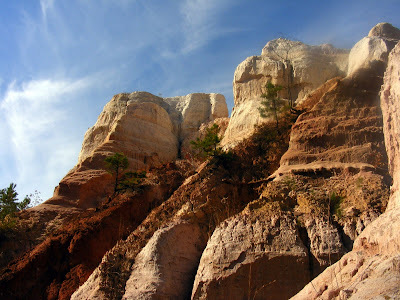 There is a second shorter overlook trail, a 6.5 mile trail deeper into the canyon known as Sitton’s Gulch Trail, and another backcountry trail taking you to more remote camping sites. When something is built up as the best thing you ever saw, its very hard for the location to live up to that reputation. 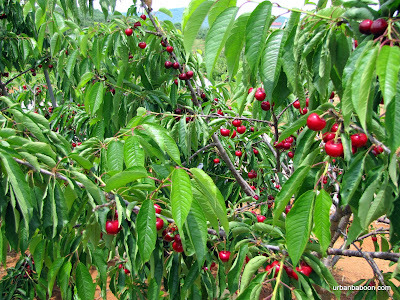 We have seen some amazing sights in Georgia from Amicalola Falls to the Cumberland Seashore to Providence Canyon . And I’ve never been to Stephen Foster State Park in the middle of the Okefenokee Swamp, which I’m sure is amazing. I don’t think that this is the absolute best thing the Georgia Parks system has to offer, but its clearly on the short list. But if you are looking for an affordable getaway filled with natural splendor, peace and quiet, and a solid physical challenge, this park delivers. The West Rim Loop and Waterfall trail combo is definitely one of the best hiking experiences I have had in Georgia, or anywhere for that matter.